Early April, 2012 in my Tokyo garden. A friend recently said that he thought some of my best writing was about gardening. "It's when I really hear you," he said. And for some time now I've not written much about the garden. The last year was intensely busy and the garden took a back seat. Truth be told the garden wasn't even in the back seat. It was in the trunk under an old blanket. I'd visit to harvest and then quickly leave. Spending more time than that meant thinking about chores I didn't have time to do, plants that were neglected, things I didn't have time to buy. Rather than a joy it became a sorrow to be there, and it seemed best to hurry away. This year I'm still busy, but marginally less so. I'm making room for the garden again. And for marmalade. And reading. I need that dirt under my fingernails (and subsequently a new nail brush) and a few good rounds of weeding to bring me back around to the physical and metaphorical space I want to be in again. So back in the garden I am with camera, notebook, pen, dirty fingers, and knees. Weeds and birds are all around this breezy spring afternoon, and I'm more than pleased to see the praying mantis egg cases in the mint and bamboo canes. Those damned aphids are back, too, but a good round of squishing paired with harvesting of my kale for ourselves and friends ought to improve air circulation and set them back a bit. A handful of winter greens - komatsuna, karashina, and mizuna - are flowering as usual, but the scent is thick and sweet and the yellow blooms bring in little pollinators for a feast I'm happy to provide. The mint and bergamont are running away with the show, and I've just managed to free one of the emerging rhubarb plants from their grip. Tulips stand at the ready with buds ready to burst into color at the first chance while crocus leaves gather fuel for next year nearby. The tatami mats are decaying pleasantly in place, and I'm already plotting what little gift to take over to the master this year for a fresh round. Some of those broccoli side shoots with a few sprigs of lavender or mint? The lasanga bed remains unattractive and I feel a bit unsure of the wisdom of creating it although the garlic looks happy and the worms I saw earlier seem a testament to its soil-building ability. Although, as I work along I can hear a passerby comment that they don't know what it's all about. 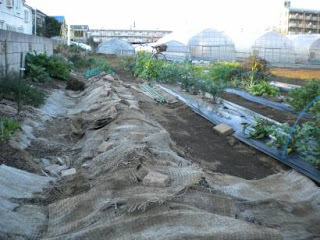 I've learned the blessing and the curse of urban gardening and farming is the audience. As much a part of my garden as the praying mantis, stray cats, aphids, birds, butterflies, and the occasional lizard, the public is there. I try to think of them as good language practice even if I don't always like what they have to say. The afternoon light shifts to orange and the shadows grow long. I look up to see the full moon rising over the buildings lining the station street a block away, and I hear the five o'clock bell toll. There's lots of work to be done yet, and I know as I pack my tools away in one bike basket and a small harvest in the other that I'm already behind. The beans aren't in and if I'm going to plant those blue potatoes I bought at the Nippori Farmer's Market I'd best get busy. The compost bins need to be turned, a bed cleared and prepped for the popcorn, and the tomato seedlings need to come back in for the night. But it's alright. It feels manageable. It feels good to be back. "I need that dirt under my fingernails (and subsequently a new nail brush) and a few good rounds of weeding to bring me back around to the physical and metaphorical space I want to be in again." BANG!That's it, Joan, that's IT, in a nutshell. To *that* space, a toast! Many thanks, Tom! A toast with rhubarb shu, perhaps? The experimental batch turned out well, if I do say so myself, and an official batch for this year will be underway this evening...hopefully. Give a shout when you're ready for extra hands, by the way.